No steering wheel, no accelerator, no brake pedal – the latest Google car is the ultimate in simple and the tech company also wants it to be the ultimate in safety. 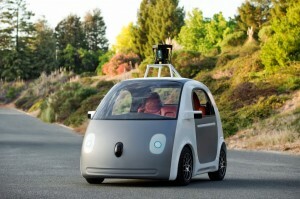 Google unveiled the ultra cute little two seater ‘car’ by giving members of the public a spin. Director of the Self-Driving Car Project, Chris Urmson said that the cars don’t have the traditional driver set-up because they operate ‘without driver intervention’ and so don’t need them. He added: ‘Our software and sensors do all the work. The vehicles will be very basic—we want to learn from them and adapt them as quickly as possible—but they will take you where you want to go at the push of a button. He envisages the vehicles will give older and vision impaired people freedom even if they can’t drive, will make drink driving a thing of the past and will take the pain (and time) out of finding parking. He said that safety is the most important aspect. ‘[The cars] have sensors that remove blind spots, and they can detect objects out to a distance of more than two football fields in all directions, which is especially helpful on busy streets with lots of intersections,’ he added. The speed in these electric vehicles is limited to 40kph. Inside, the interior was deliberately kept basic – it has two seats, with seatbelts, two cup holders, an area for passengers’ belongings, a screen which shows the route and a start and a stop button. Writing on the Google blog, Mr Urmson said it’s planning around 100 prototype vehicles and will begin testing early versions with manual controls later this summer. A ‘small pilot programme’ is then on the cards for California if all goes well. © 2018 atTheLights.com. All Rights Reserved.